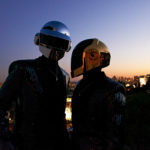 Daft Punk’s ‘Get Lucky’ now shares more than summer anthem status with ‘Blurred Lines’ thanks to T.I. The great song of the summer debate may not have been settled once and for all at Sunday’s VMAs. The conversation includes Robin Thicke and Daft Punk, situating “Blurred Lines” against “Get Lucky” for this season’s anthem due to both tracks’ heavy rotation across American radio stations. Now thanks to Thicke’s collaborator, there’s a fair medium between hits. Rapper T.I. who laced a verse on “Blurred Lines” has now done the same for “Get Lucky,” giving the robot’s lead single the “featuring Pharrell and T.I.” label that its competitor originated. Editors’ Note: To Daft Punk faithfuls’ relief, T.I’s hip-hop verse comes with more integrity to the original than most of the unofficial reworks that have saturated the blogosphere. Just don’t tell Pitbull I said so. Tags: daft punk, get lucky, T.I.